Occasionally, a unique ID is copied to multiple computers. This typically happens via cloning or system migration. Each computer continues to report to the server but has an identical ID. The Watchman Monitoring Server tracks of these changes and generates an email detailing the change in demographics. After three check-ins, the Watchman Server will notice that the Watchman ID has been duplicated and will instruct every computer with that Watchman ID to reset its Watchman ID. Note: It can take up to 24 hours for this process to complete. 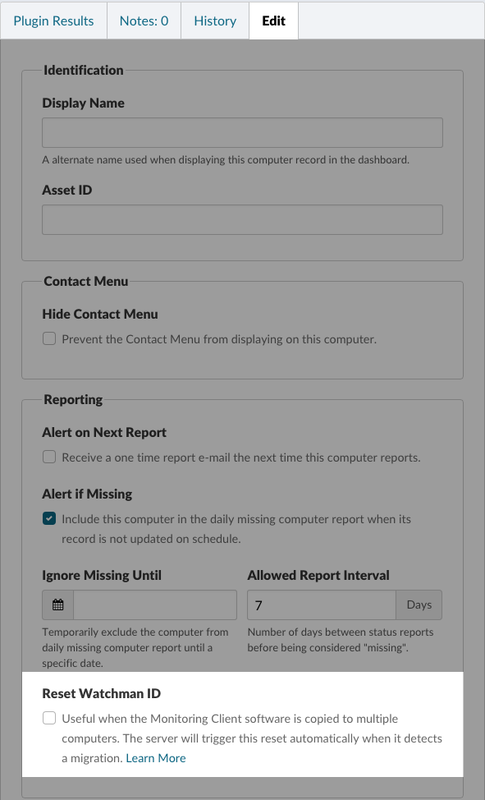 Both client and server side resets will trigger a report with the results of the Watchman ID reset. Open the Client Record for the computer whose Watchman ID you'd like to change. When the Monitoring Client checks into the server, it notes the rekey flag and resets the Client ID.